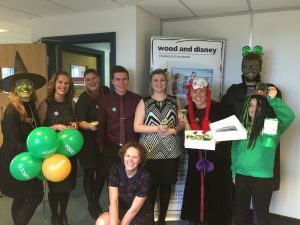 Colchester NSPCC Business Group – The Colchester NSPCC Business Group is a volunteer goup of businesses who come together to host charity events through the year in aid of the NSPCC in Colchester. Colchester’s NSPCC Business Group represents local businesses who understand the need to support vital NSPCC services in our own community with all funds raised staying local to the town and county. Over 90% of funding for the NSPCC comes from fundraising activity, not from government funding which extenuates the need to raise more funds to enable these vital services to continue and help more local children. The Business group’s flagship annual event, the Emerald Ball, launched in 2008 at the Weston Homes Community Stadium, the home of Colchester United raising £5,730. The Ball continued to grow in popularity and in 2017 marked its tenth and final appearance on the Essex social calendar held at Stoke-By-Nayland Golf & Spa Hotel. The next planned fundraising event is The Bear Diaries and will launch in Colchester on 1st October 2018. For information on future events please email katie@katmarketing.co.uk or call 01206 765544.